Bonsai [kanji 盆栽] has become known across the Western world as well as much of Asia, yet as an English noun it has only existed as a dictionary word since 1950 describing, in the main, the rather enigmatic world of individual miniature trees that have been painstakingly clipped and trained; it has morphed into being more of a generic term in the West. As a Japanese art form, it developed during the 14th century from what was then known as ha chi noki [鉢の木; “the potted trees”], the art of propagating miniature trees in deep pots. It moved from being a singularly esoteric practice to being a more mainstream past-time in the 19th century. Few people realise that Japan had imported the concept from China, mainly through Japanese Imperial embassy representatives and Buddhist students who visited China. Pénjǐng [盆景], the ancient Chinese art form meaning literally “tray scenery”, also known as pénzāi [盆栽], “tray plant”, began to slowly develop back in China in the Han Dynasty [206 BCE – 220 CE] and, as with many Chinese decorative art forms, it was inextricably linked to trade with the outside world – or to be more exact, the outside world’s trade with China; the Han dynasty was an age of economic prosperity carried over from the previous Zhou Dynasty. 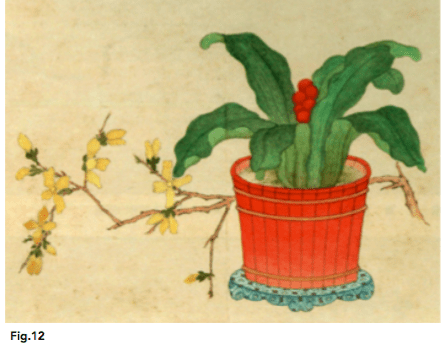 Foreign merchants brought herbal aromatics into China, never before seen there. 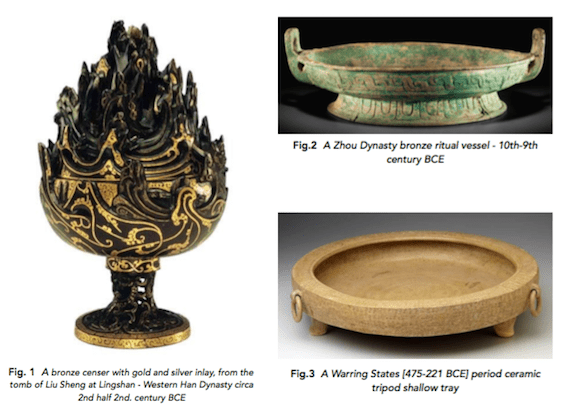 This, in turn, engendered the creation of incense burners specially designed for these new fragrant herbs that took the form of a short-stemmed cup [boshan lu] with a perforated lid more often than not in the form of a stylised sacred mountain or island [Fig. 1]. For practical purposes, a shallow lipped dish [pén] was placed under the stem of the burner to catch stray embers or ash; the pén, as a Chinese item, finds its roots in China even further back in the Shang Dynasty [1600-1046 BCE], manifesting firstly in pottery and later in bronze and used originally for food or as water vessels [Fig. 2 & 3]. This then morphed into being a more ceremonial item in bronze during the Zhou Dynasty [circa 1046 BCE–256 BCE]. The stylisation of the mountain form in early censer objects is, in many respects, similar to the stylised representation of mountains in shān shuǐ traditionalChinese painting; a term that translates best as meaning “mountain water”, but in fact is the nearest Chinese equivalent to the Western concept of landscape painting as the Chinese saw it. This style set out to depict natural landscapes or scenery using pen and inks. The style developed in the Sui and Tang Dynasties [circa 550-600 CE], originally introduced by the artist Zhan Ziqian. His only known existing painting is entitled “Strolling About in Spring” [Fig.4]. As a definitive style, it aimed to create a stylised visual allegory of that mystic dichotomy that characterises Daoist cosmology, the mountains representing the solid reality of the Earth, exemplified by the principle of yang and the waters invoking the imperceptible essence of yin. 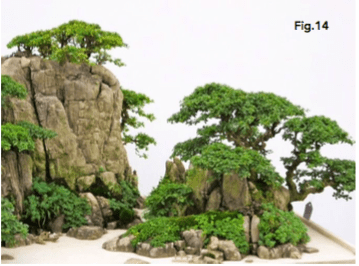 This very same principle of the landscape and the elements within a landscape also form the principles of penjing, allowing for the re-creation of a landscape or part of one in miniature. The pén is as crucial to this art form as the appropriate frame is to a Western painting. Penjing has a philosophy all of its own, heavily steeped in aesthetics and values as the Chinese mind has been trained to perceive them. It is an art form that sets out to present the nature of nature, as opposed to nature itself; the heavy, yet accurate, stylisation emphasises the extreme features of the natural landscape which in turn help convey emotions to the human species, itself being an completely essential harmonious part of the landscape. over the aesthetic canons and artistic themes of all the Chinese visual and decorative arts. Just as the aromatic herbs that came to propagate the use of incense burning in China was introduced to the country by way of the Silk Road, so was Buddhism introduced by the momentum of the same foreign merchants. As with almost every foreign concept that eventually became so entrenched into Chinese culture that it came to be perceived as being essentially Chinese, Buddhism, in the act of being absorbed into the Chinese psyche, underwent many processes of integration, adaptations and modifications3. 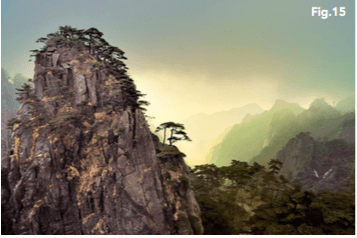 The various creative arts, music included, all came together to form the primordial glue behind an eventual social framework as well as allow the consolidation of devotional rites and beliefs; penjing is very much part of this primordial glue. Classical Chinese art forms aim to convey a poetic and spiritual serenity – the pain, anger, grief and even lament of Western art are not to be found in their Chinese counterparts. opened the door for the setting up of foreign treaty ports and designated treaty trading areas around China. A 60-year period of manufacturing silver items that were essentially English Georgian in form, style and quality or European styles that were parallel equivalents of the Georgian style came to an abrupt end. 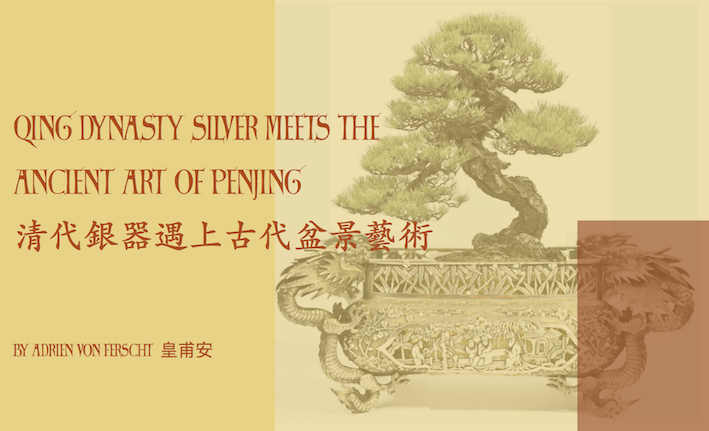 It needs to be stressed that during this 60 years, the very same silversmiths continued to make silver items in traditional Chinese styles from the same work benches, albeit these styles underwent their own various transitions as all styles do by the natural course of time. 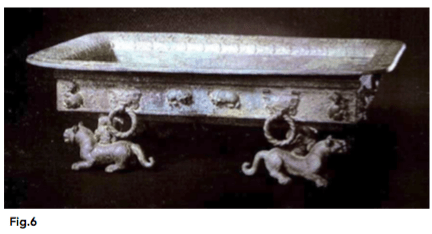 Perhaps more importantly, post-1842 various silver items began to gradually appear that were wholly new to the Chinese silver repertoire yet were perceived by most Western eyes as being ‘traditionally Chinese’ to the point where one could begin to question whether this was, perhaps, either wishful thinking or simply an ill-informed perception. 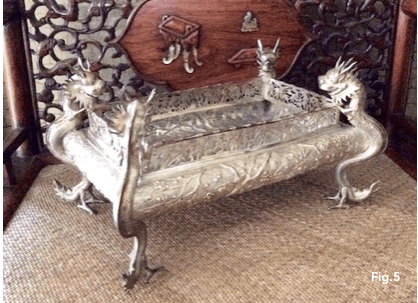 that already had Imperial and literati connotations to acquire more visually dramatic imperial overtones with the addition of the four dragons peering guilefully into the container; the very notion of requiring a lavish silver container for a pén is in itself an form of aggrandisement that essentially should be anathema to the rigid principles of penjing – Wang Hing & Co was masterful in creating a piece of theatre in silver; it is what the clientele of the time demanded. 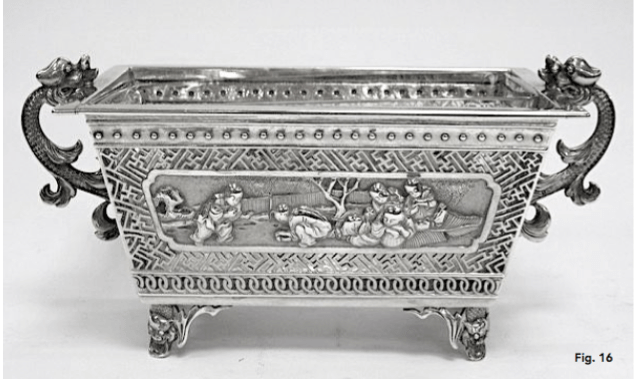 This elevation of the pén goes against the grain of using what is essentially an utilitarian vessel to form the ‘frame’ for a miniature landscape, but 19th century China was rife with such tendencies of aggrandisement with the emergence of an affluent Chinese middle class for whom such silver items were particularly created for – a pén with attitude, if you will, for people who craved the ability to demonstrate a newly acquired need for social attitude. Perhaps an effective modern-day comparable might be the need to have a silver screw-cap for a Marmite or ketchup bottle; for the nouveau-riche it is aspirational, for the ‘establishment’ it is a form of satire aimed at the nouveau riche. 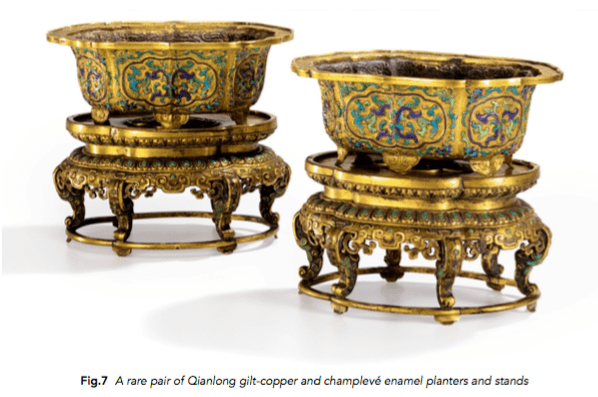 But what these silver items demonstrate is they were aimed at the emerging affluent Chinese middle class in China and Hong Kong as well as an expanding number of foreign residents, many of whom became, in varying degrees, dedicated Sinophiles, of sorts. Few of these items were made specifically as export items simply because they would have had no meaning in the West, neither would they have been of any practical use. It would have been the ex-pats returning home with those items that probably caused them to become ‘centrepieces’. native country at some point in time doesn’t make this piece an export item; there was no shortage of ex- pat residents that did eventually return to their countries of nationality with their entire household possessions. Exactly the same applies to the pén in Fig.9 except it was sold by one of the largest luxury goods emporia in Shanghai, Hung Chong, for an equally burgeoning affluent market that mirrored Hong Kong in every way. There is certainly evidence of use of a Chinese equivalent of the Western, more ornate in concept, jardiniere, at least in the Qianlong era [1735-1796]. 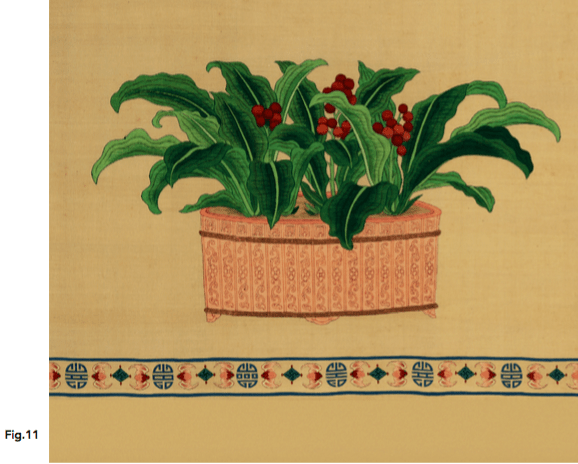 The Kesi panel [Fig.10; 11] is finely woven with the Qianlong imperial poem ‘Wànniánqīng painted by Chen Kua’, which is accompanied by a depiction of a Rohdea Japonica, also known as the Nippon Lily or Lily of China, planted within a jardiniere. [Wànniánqīng] means ‘verdant over ten- thousand years’, but the character qing is also a synonym with the character for purity – it became a symbol of everlasting rule and political purity as well as a subject matter suitable for imperial works of art, as evidenced by an album leaf [Fig.12] painted by the court painter Shen Huan [active 18th to early 19th century], which may well have been the source of inspiration for the scroll. 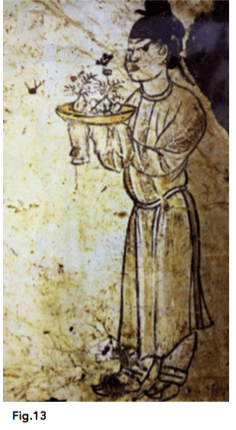 Possibly the earliest known evidence of the art of penjing being a definitive part of Chinese imperial culture may be seen depicted on part of a fresco [Fig.13] discovered on the wall of a tomb built for the Tang Dynasty prince Zhang Huai [[653–684 CE]. Archeologists discovered painted frescoes depicting female servants carrying a pén containing miniature trees and rocks. The tomb is within the Qianling Mausoleum, ‘the mausoleum of the heavenly hexagram’, situated on Liangshang Mountain and one of eighteen mausoleums of the collective twenty emperors of the Tang Dynasty. Liangshang is roughly 85 kilometres northwest of the former capital, Xi’an. But shanshui penjing by no means entails the illogical ‘torturing’ of plants; in many mountainous regions of China, trees can readily be found growing in the most forbidding of circumstances and become naturally distorted as a result, as can be seen in the Yellow Mountains in Anhui province, for example [Fig.15]. As with traditional shān shuǐ painting, any form or style of true penjing is created by simply being critically observant; critical observance is probably one of the cornerstone precepts of traditional Chinese visual and written arts forms and philosophical thinking. It could even be deemed as being part of the Chinese pysche today and is almost certainly one of the defining differences between Chinese and Western cultures throughout history. 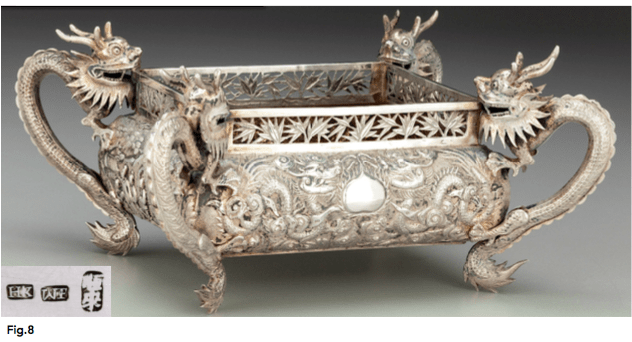 Less ornate and arguably more in keeping with the concept of a pén, the reticulated and repoussé piece carrying the silver mark of the Shanghai retail silversmith Yung Lei [Fig.16]. Dating to circa 1880, the two long sides show a vignette of a courtyard scene framed by a fretwork meander motif border. While examples of Yung Lei silver items are fairly rare to find, all recorded items demonstrate it was obviously a high-quality emporium. What is interesting is the discovery of items like this today and to understand what influenced them in the context of the time of their manufacture and then understand how time, Western perceptions and misconceptions have changed them almost irrevocably – the joy of cultural anthropology, after all! Special thanks to Dr Huang Chao, Sun Yat-Sen University, Guangzhou for his dedicated cooperation.